Russia successfully tested a new radio-electronic weapons system recently which, Russian military experts say, serves to destroy airplane and drone onboard equipment, as well as electronics found in high-precision weapons. A radio-electronic weapon has been successfully tested by Russia recently. Russian mass media sources, citing representatives of the Rostec Corporation, have reported that the system has no rival in the world. Rostec is the state-owned producer of industrial products. The new weapon models are classified as "top secret" for the moment and only Russia's highest command has seen them, during private exhibitions at the Army 2016 and Army High-Tech 2016 International Military-Technical Forums. Rostec Corporation would only partially shed light on the new system’s potential when RIR asked it for comment. Leonid Khozin, the company's press secretary, said that the new weapon consists of electronic equipment that operates on a wavelength principle. "It incapacitates electronics and other onboard equipment on enemy planes, drones and high-precision weapons. This is land equipment. At the same time it can withstand land, sea and air attacks," explained Khozin. He remarked that the device "strikes" targets many kilometres away, but declined further comment, citing state secrecy. Which Russian forces use radio-electronic weapons? Mikhail Khodarenko, military observer from the Gazeta.ru publication, said such systems are used in the radio-electronic warfare division, and their ability to remotely "switch off a missile" before its launch is one of the decisive factors for winning in modern warfare. "Combat electronics is capable of winning the war before its ‘official’ beginning. It is enough to turn on the system that electronically suppresses the enemy's aiming, guiding, radar and communications systems and not one combat unit will move from where it stands. The unit will not be able to react to shelling and will thus be destroyed in the first minutes of battle," said Khodarenko. In military circles, both in Russia and abroad, such forces are usually not talked about in public. In the army they are included in the communication subunits. The reason is that it is necessary for them to carry out their functions hidden from enemy eyes. Radio-electronic warfare systems are used not only as an "attack" resource but also to make forces invisible to the enemy's missiles and planes during combat. Russia’s Ka-52 combat helicopters, first "baptized" in the skies over Syria, have been equipped with the Vitebsk and the President individual protection systems. "They cause interference for missiles with optical and infrared homing warheads, creating particular electronic ‘traps’ in the range of interference. They also inform the pilot of the approaching enemy missile. Depending on the type of warhead, they can turn it off from its trajectory as it's flying towards the target," said Viktor Murakhovsky, editor-in-chief of Arsenal Otechestva (Arsenal of the Fatherland) magazine. It is possible to illustrate the potential of the radio-electronic warfare systems installed in helicopters on similar radar systems used for protection from heat-seeking missiles. In an incident in the suburbs of Aleppo recorded by fighters from the Authenticity and Development Front, a moderate opposition division supported by the U.S., opponents opened fire on a Syrian Russian-made Mi-17 military transportation helicopter using a Igla-1 anti-aircraft missile system, also made in Russia. It can clearly be seen how the electronics reacted. Also, according to Murakhovsky, Krasukha-4 radio-electronic warfare systems have been deployed around Russia’s Khmeimim air base to incapacitate wiretapping and the enemy's weapon aiming systems. The Krasukha-4 "covers" all the enemy's locator systems and they can readily see targets at a distance of 250 kilometres (155 miles). 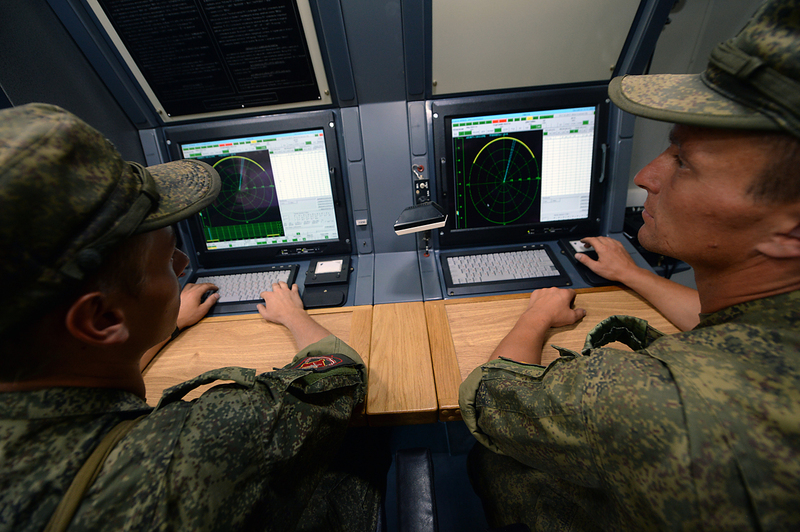 "In Russia, radio-electronic warfare systems have always been very developed. Their main problem is the ‘elemental base.’ It is known that Russia cannot produce the best high-technology models because of international norms. But concerning radio-electronic warfare systems (super-high frequency, gallium arsenide and power components), Russia is doing very well," said Murakhovsky. Experts believe that 70 percent of Russia's radio-electronics warfare fleet will have been re-equipped with new models by 2020.